On Love. 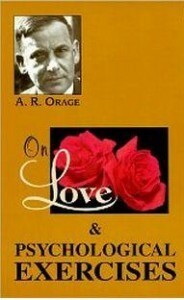 Freely adapted from the Tibetan by A. R. Orage was first published in The New Republic (New York) in December 1924, then as a 24 page book by The Unicorn Press in 1932, this has became Orage’s most anthologised essay. It is said that Orage wrote this text after a late night conversation with Gurdjief, which he was introduced to by Ouspensky in 1922 – this is another incredible and somehow sad story you might want to dig into. The Wikipedia article on Orage is a good place to start.